We all need love. This is because that love make us feel connected to others, and this connection eases, or even eliminates our biggest fear: loneliness. Thus love becomes the greatest – sometime the only – reason for us to live. But, unfortunately, love from others are not entirely secure. It comes and goes without warning and it’s not within our controls. This is because love from others usually is “conditional”, which means it happens only if we possess certain conditions, such as physical beauty, wealth, social status, etc. So without these conditions, we are in danger of losing love. But, if one possesses a type of love that is “unconditional”, he/she would feel the most secure in his/her life, because this love is provided regardless how he/she is, and stays with him/her as long as he/she lives. So where does unconditional love come from? I found that they mostly come from two sources: 1, parents; 2, one’s own. If we take “love” – love in any form: romantic, family and friendship – as a proof of our life existence, love is certainly the most important aspect of life, because only if we appreciate our existence in the first place, are we able to fulfilled it. The more love we receive, the more meaningful and joyful we feel our life is. That’s’ why we all desperately search for love. 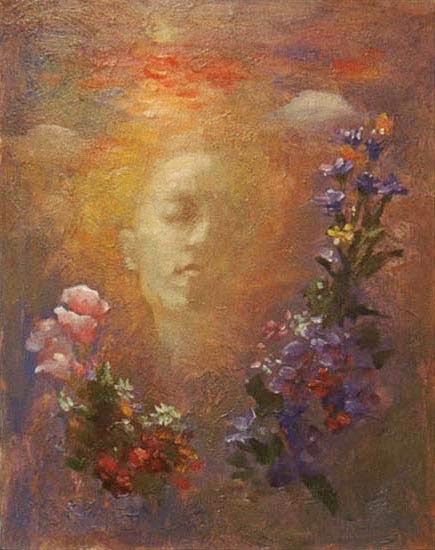 Despite that I always know that art is not the best for me as a life time endeavor, and feel that art profession for me is overall like a very unhappy marriage which hindered many other interest of mine, I am still proud of what I’ve done in this field, professional or none professional wise. Having not being able to focus on reading or writing for a while (due to my physical condition), I decided to re-organize my art works and put some of them into multiple art sale places to try my luck. I don’t hold much hope on this task as I know art sale never is easy, especially, for a “retired” artist like me, who would not likely create many more works. I do this mostly just to put a big period mark to my past. I may paint or draw again sometime, but I am more than happy to move along, spend my rest of my life for something I wanted to do so badly but couldn’t because of “art”. Goodbye art! No matter how many unhappy – sometime even miserable – moments we had together, I am willing to keep only happy ones in my memory, like how I remember Savannah. I have been complaining about how much misunderstanding a chronic illness sufferer would receive in her/his daily life, which is true, but, still, there are plenty of understanding out there, to which I am not blind. The incidence of last night was one of them. Yesterday (Christmas Eve) I was invited by a parent of my student to a Christmas dinner party. It was a joined family parties by at least 3 families, which I know them all. I thought I was in good condition so I happily agreed to come. So late afternoon, I went to bought some presents, and arrived their house a little after 5pm. I consider myself very spiritual. I used to almost completely ignore my physical needs, fatigue, pain, illness, etc., but, after paying a sky-high price for my ignorance, I become almost completely obedient to my physical part of myself, when to eat, sleep, rest, I act like a soldier following orders of general. Of course, this change took many years! I wonder how many people really know how much we owe to our great physical conditions for our “noble” spirits. Most people take it for granted that we have some superior mental dignity which can exist independently from our physical existence, not aware of, or admit, that without our physical support, our spiritual beings could simply fall apart. Of course, we saw many cases that one could be physically broken but still hold spirit high, but, based on my personally observation/experience, hardly anyone can sustain long term physical torture, either imposed on them by others human beings, or by illnesses. As matter of fact, I even think, arguably, that our high spirit after all, is nothing more than an “appearance” of something completely physical. For quite a while, my physical condition has been soaring up, and the spiritual side of myself is also reviving. Though overall I am still a little more than 80% of myself, I know that I am on the right track – at least for myself: no longer hold my spiritual desires above my physical needs. Mind succumb to body, because health is everything, indeed! It’s one thing to live life, another to understand life. The former requires subjective belief, the latter requires an objective (honest) mind. Since I learned words “lush green” (from my dear blogger friend Madilyn – aka “jerseylil’s 2 cents“) early this year, these two words jumped in my mind wherever I went, simply because that’s all I saw during the season. Trees in NC are so dense that I once complained they blocked my view. Now, I learned to love them. They did not block my view, they are the view! Had I lived somewhere with wide open vista, I may lose the sight of all these beautiful plants. As I drive around everyday, I enjoy watching all the dense woods and I realized that I should only appreciate them because in somewhere people have to pay to just see them. I can’t be too greedy! North Carolina is a natural huge plantation. Here I see the most trees in my life. Not only “green”, other colors joined landscape as well since spring. Pink, purple, red, white, all different kinds, show up here and there, made the view even “lusher”. 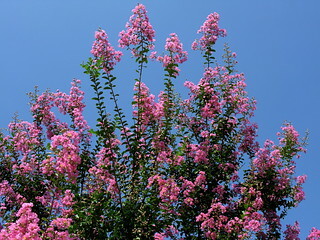 Among all these colorful plants, I found crape myrtle the most showy. They have all qualities of different plants: trees and flowers, deciduous or evergreen. You would mistake them as small bushes when they are young, but some of them in fact grow into 30 feet high. They are as elegant as roses or rhododendrons, as upright as maples or pines. I absolutely fall in love with them and very pleased to see we have many of them in the area. I even decide to plant several of them around my house.Oh I love plants. So much more than I love animals. As matter of fact, I am not sure if I love animals – include humans – any more. Let’s face it, what plants contribute to the earth? Oxygen, beautiful views, nutrition, cure remedy, you name it, all good thing, right? What do they take for survive? Light and air, which is almost nothing! For what I know plants make their own “foods” out of air and light. What animals take? Other lives. And what do they do to the world? Jeopardize each others life! Life of humans and animals is completely rely upon other lives, both animals and plants. We humans could not live independently like plants. We have to kill other lives in order to survive our own. I have to wonder, if there were a designer, is this (living by killing each others) really a good design? A few days ago while I was driving, I suddenly wondered, if I look at earth from sky, and imagine the earth as a cute little pet, such as a dog, plants – trees or flowers – must be the dog’s hairs, beautiful and soft, nice to be touched, yet they protect the dog from harsh environment. Then what are we humans like? Fleas. Yes, we, together with all other kinds of animals, are fleas, or parasites, live on the body of this beautiful dog, bring her/him only trouble, while he/she doesn’t need us at all. I understand I am being cynic again. I better give more credit to humans or animals, since their (our) being here is not their choice. I have made decision, in my next life if I cannot choose to be an eagle – which is a selfish choice, as I just mentioned animals’ lives depend on other life forms, I would be a tree, absorb light and air, quietly be part of this selfless and unconscious beauty of the Earth. Right now it’s middle of Summer. Humidity has been giving me trouble, but the beautiful view makes it worth it. And while I enjoy this lush view, I patiently wait for the autumn, another highlight of the year.